Shepherd’s crook deformity is a term used to describe a pronounced coxa vara angulation (femoral neck-shaft angle <120°) and lateral bowing of the proximal femur. This deformity may be found as a sequela of fibrous dysplasia (most severely in the setting of McCune-Albright syndrome), osteogenesis imperfecta, and Paget disease. A compromise in structural integrity of the femoral neck and trochanteric region leads to progressive loss of the neck-shaft angle and bowing. This may result in pain, restricted range of motion, limb shortening, leg length discrepancy, gait alteration, and a dramatically increased risk of pathologic proximal femur fractures. Shepherd’s crook deformity can be difficult to treat due to its rarity, large spectrum of severity, progressive nature, and potential for recurrence. Intralesional curettage and bone graft, once thought to halt the progression of deformity in fibrous dysplasia, has been shown to be of limited use, as the graft is resorbed over time and the bone reverts to its dysplastic state. Similarly, intertrochanteric osteotomy with a hip plate and screw has proven to be prone to failure via cutout of the cervical screw, diaphyseal screw loosening and pullout, periprosthetic fracture, and deformity below the level of the plate. 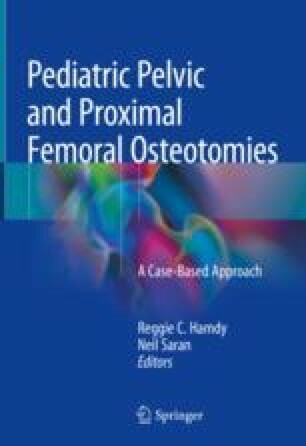 Recent literature has shown promising results using proximal femoral osteotomy with intramedullary rod fixation and femoral neck stabilization to correct the neck-shaft angle and prevent progression and recurrence of deformity secondary to fibrous dysplasia.